Eliminate username and password hassles. Sign into all your applications with a single set of login credentials, allowing one-click access to browser, mobile and on-premises applications. Easily connect to thousands of cloud applications through pre-built connectors or generic templates, to speed up business adoption of new applications. Enhance security and meet compliance mandates with custom authentication policies. Infuse multiple user authentication methods for stronger security with IBM Verify. Provide a user self-care interface to let employees to request access to applications and reset and manage their own passwords. Schedule periodic access reviews to ensure continuous compliance. Extend seamless SSO to apps covered by enterprise mobility management solutions. Conveniently find, view, and access all your applications from a central location. A launchpad that unifies all apps, both on-premises and in the cloud. Give developers the toolkits to quickly integrate the latest authentication methods into new applications. Streamline user onboarding, off boarding, and self-service access request policies for both on-premise and cloud applications. Reduce time and skill dependencies on IT. Delegate the responsibility of application ownership to line of business managers, empowering them to provide their employees with faster access to applications. Integrate commonly used on-premise directories like AD/LDAP. 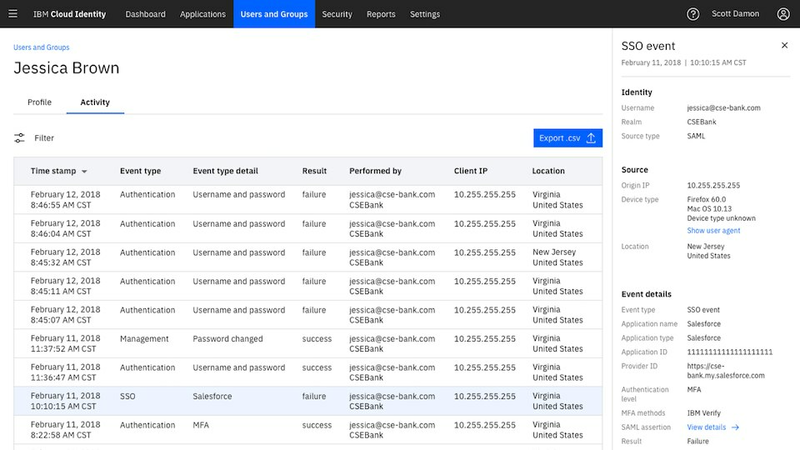 One-click activation allows IBM Security Access Manager (ISAM) users instant access to IBM Cloud Identity. Sign into all your applications (Cloud and On-Premises) with a single set of login credentials. One-click access to browser, mobile, and on-premises applications. Evaluate and understand cloud application risks via risk score, compliance data, and URL locations. 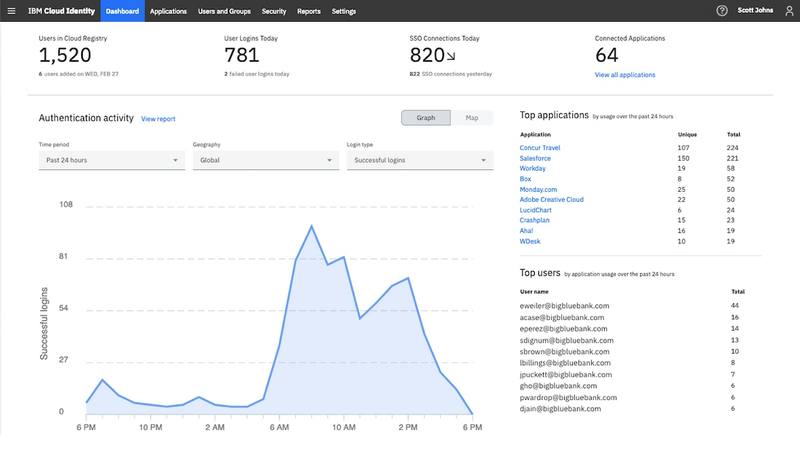 Gain insight into cloud application usage highlighting SSO connections, and successful or failed logins. Providing users one place to access their authorized applications and request approval to new ones. Allow your users to access all of their approved applications from a simple launchpad. 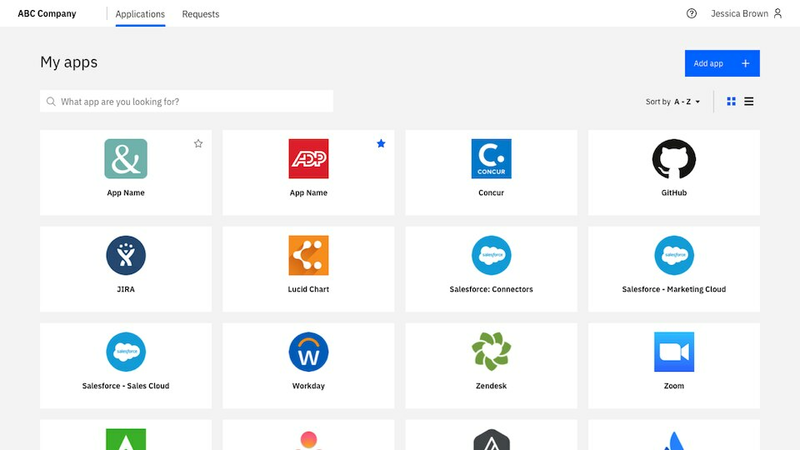 Users can browse an application catalog and request access to new applications, then track the approval process so they know what’s in progress. Dive into reports of authentication events to identify patterns and investigate suspicious behaviour. Dig into specific users to investigate common issues like SSO activity, account lockouts, login failures or credential resets.